Description The roots of the kit-build Safari go back to the single-seat Helicom, which was designed by the aeronautical engineer Harold Emigh and his son in the early years of the 1960s. Later, the model was developed into the two-seater Commuter II. Canadian Home Rotors (CHR) then took the Commuter II design and developed it further into a helicopter called the Baby Bell. The model was brought to the market at 1992 in Oshkosh. After Bell Helicopters objected to the name, it was changed to Safari in 1999. 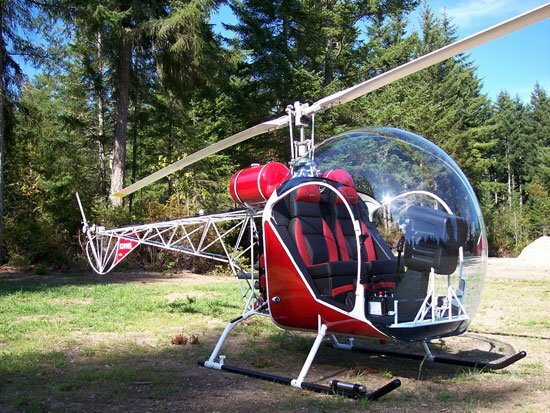 The Safari is a Bell 47 look-a-like, and also uses its certified bubble canopy. The machine, which is in the experimental category, is sold worldwide either as a kit or 'ready to fly'. It has proved to be a successful product in the market of home build helicopters. In 2009, CHR International acquired the rights to the Safari helicopter and started moving the production facilities from Canada to Florida, USA. The roots of the kit-build Safari go back to the single-seat Helicom, which was designed by the aeronautical engineer Harold Emigh and his son in the early years of the 1960s. Later, the model was developed into the two-seater Commuter II. Canadian Home Rotors (CHR) then took the Commuter II design and developed it further into a helicopter called the Baby Bell. The model was brought to the market at 1992 in Oshkosh. After Bell Helicopters objected to the name, it was changed to Safari in 1999. Do you want to comment the Canadian Home Rotors Safari helicopter?